Chance has left a mark on Philadelphia by discovering those who’ve maliciously made one of their own. The nearly 9-year-old black labrador has been Sniffing out arson cases for more than two thirds of his life. But now Chance is retiring from the Philadelphia Fire Department. No longer will he be rooting around for signs of kerosene, diesel fuel, gasoline, charcoal lighter fluid, lamp oil, and other accelerants, Philly.com reports. Chance is bound for a happy home life with his handler, Lt. George Werez, and he has a new bone and rope to commemorate the event. Chance’s olfactory expertise proved effective in almost 900 cases, a few which could have turned out much differently were he not there. As Lt. Werez noted at the dog’s send-off, Chance has found canisters of gas, and fire bombs still in tact, even after the blazes had been extinguished, ABC News maintains. Fire Commissioner Adam K. Thiel offered Chance the city’s thanks, along with his new chew toys, which the dog graciously sniffed but did not immediately accept. “Clearly he’s retired,” Thiel said. 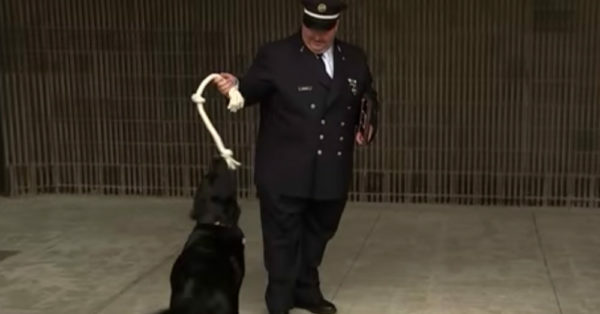 The Animal Rescue Site wishes the best to Chance during his retirement, as well as to the other heroes who continue to serve as accelerant-detecting canines throughout the United States. On the other side of the country, a dog named Tucker has also left a very important career. The dog once helped researchers study orcas by sniffing out their poo. Click the button below to read more about Tucker’s talents and how he’s put them to good use! The post Chance Saved Countless Lives Sniffing Out Arson Accelerants, But Now He’ll Be ‘Working’ From Home appeared first on ILoveDogsAndPuppies.